Provide explicit writing instruction, along with abundant practice. Written communication, even for the most skilled authors, is a complex, constant quest. The more one learns about writing and language, the more the self-challenge intensifies. For this reason, school programs should provide explicit writing instruction along with abundant writing experiences. Not only do students learn to write through writing, the process enhances understanding of written language and improves overall knowledge. While programs focus primarily on the development of writing skills, oral language must also be considered. The number of students in U.S. classrooms having English as a second language has more than doubled in the past decade and remains the fastest-growing student population group. Native English speakers also benefit from structured oral language development. Many common grammatical errors are present in both oral and written communication. Research findings document that literacy learning is most efficient when reading and writing are taught in tandem. These skills are so closely interrelated that combining them in instruction is efficient and speeds the attainment of proficiency in both areas. Studies show that the weak link is writing instruction. When programs do not have adequate instructional emphasis on writing, both writing and reading are negatively impacted. poetic writing – expressions of thoughts or events through use of poetic structures. English words are divided into categories according to usage, and students need to understand word function from the earliest grades. The parts of speech are: verbs, nouns, pronouns, adjectives, adverbs, prepositions, and conjunctions. Interjections (words of surprise, such as oh or wow) are rarely used and can be taught separately. Parts of speech explain how a word is used in a sentence, which means that words often function as multiple parts of speech. This can be quite confusing, as is shown with more. ADJECTIVE More people than ever do not have health insurance. ADVERB Mother’s garden is more beautiful than ever before. NOUN I liked the idea better the more I thought about it. PRONOUN More were discovered as the search continued. To make matters more perplexing, there is not universal agreement on every grammatical matter. When there are several parts of speech for a word, it can be challenging to ascertain what the part of speech is based on its usage in the sentence. Conflicts among dictionaries and other reference sources can be found. Confusing usages should be avoided, and teachers should focus on information that benefits students at their instructional levels. Reading Manipulatives had color-coded Parts of Speech Sentences (not available as PDFs). Students build usage concepts as they put the scrambled sentences together. Each piece has an alphanumeric code that denotes set and sentence number. Students must first sort the words into five sentences. Next students put the sequential scrambled sentences together. Then, as they analyze the sentences, students see how nouns, verbs, adjectives, adverbs, conjunctions, and pronouns are used in sentences. This concrete method shows students the function of words and phrases, or their parts of speech. In many languages, verb construction is straightforward, following clearly defined patterns. However, this is hardly the case with English. While singular or plural forms and tense may be handled by simply adding the appropriate suffix, many verbs have irregular forms. Additionally, auxiliary verbs are necessary in some constructions. The verb tense denotes the time of the action or being of a verb. Tense is always marked by the first verb in a verb phrase. If the verb is not a simple present or past verb (she sleeps, she slept), the first auxiliary, which precedes the main verb, indicates the tense (she has been sleeping, she was sleeping). Verb forms used with helping verbs are referred to as participles. The past and past participle of many frequently used English verbs have irregular formations. 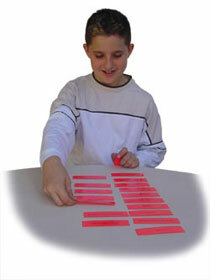 The Reading Manipulatives Irregular Verbs task cards clarify usage of 50 troublesome verbs. 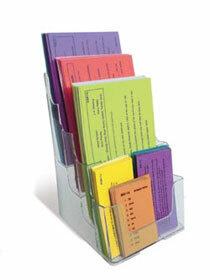 Students are given the present, past, present participle, and past participle verb forms at the top of the card. They must select the correct verb tense to complete each cloze sentence. While fluent communication is highly valued in our society, using proper English is a daunting task. English is rife with irregularities, and acceptable usages are occasionally revised. In addition, English has several times more words than any other language, and new words are constantly being added. For these reasons, improving communication skills, particularly writing, is a tremendous challenge facing teachers and students. If students are taught to avoid a limited number of common communication errors and writing pitfalls, they can improve their writing substantially. These grammatical and syntactical errors detract from credibility. On the other hand, command over written and spoken language enhances an individual’s ability to communicate with and convince others. Inaccurate usage of certain words or grammatical constructions is often habitual. As a matter of fact, misuse is so common that many do not recognize the errors. If teachers offer lessons on these topics and extend application into assignments, writing skills of students are advanced. The following are some particularly confusing usages. Pronoun case (subjective, possessive, objective) is often confused, particularly in usages with compound subjects or objects. Who is used instead of whom in the objective case, and misuse is so common that it is becoming acceptable. Possessive pronouns and contractions are interchanged (its and it’s). Adjectives and adverbs are interchanged. Good is commonly used instead of well, especially with linking verbs or the verb do. Students should understand that adjectives follow linking verbs, and that adjectives modify nouns and adverbs modify verbs. Transitive verbs need objects and intransitive do not. Many individuals confuse the transitive verb lay with intransitive verb lie, which has lay as its past tense. Relative pronouns that, which, and who are often used incorrectly when beginning a dependent clause that refers back to an antecedent. That is used in restrictive clauses that provide specifying information. Which can be used in restrictive clauses or in clauses that provide additional information, and these clauses should be set off with commas. Who is used when the clause gives more information about a person(s). When two negative words are used in a statement, the intended meaning is reversed. Do not shift from present tense to past tense (or vice versa) unless there is a reason. The Reading Manipulatives Troublesome Words & Usages task cards demonstrate correct usages for these grammar and writing nemeses. Application exercises then help students to improve their communication by recognizing errors and learning correct usages. Most mechanics rules are absolute. For instance, sentences and proper nouns begin with capital letters. Others have alternative acceptable styles, but a writer must be consistent in the style that is selected throughout a composition. Since a teacher or materials utilized in a classroom must teach concepts, students should be taught specific rules for handling these variable usages. Otherwise, they are likely to be inconsistent in their application. 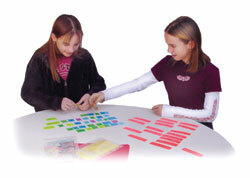 Reading Manipulatives offers two levels of Capitalization & Punctuation cards. These sets assure that students review and apply all capitalization and punctuation rules. Each card begins with a lesson on a category of words that are capitalized or a specific punctuation usage. Exercises on the cards then provide drill to assure that students understand the rules and apply them accurately. All capitalization cards are to be done first because punctuation cards drill punctuation rules and also require students to add capital letters as needed. This issue offers strategies for remembering words that need capital letters. A reproducible student reference chart lists the categories of proper nouns that must be capitalized, along with examples. The one-page handout should be a valuable aid for students. A sentence is a group of words that expresses a complete thought. They are written in four forms, according to function: declarative (statement, includes most sentences), interrogative (question), exclamatory (sudden, strong statement), and imperative (command). A sentence contains two essential parts, a subject and a predicate. In some sentences, the subject is understood. Generally, these sentences are commands (Get the dog out of the street.). The subject is who (person, animal) or what (thing, place, idea) the sentence is about. The subject is doing or being something. The first part of the sentence contains the subject. A simple subject is the subject of the sentence stripped of all modifiers. The predicate is the second part of the sentence. It tells what the subject does, has, or is. Predicates always begin with a verb. Think of a predicate as the "completer" of a sentence. Likewise, the simple predicate is the verb alone. These sentences are divided into subject and predicates. The simple subjects and predicates are underlined. More Indians / live in Arizona than any other state. China / has the largest population in the world. Nonpoisonous boa constrictors / squeeze prey to death. Understanding subjects and predicates helps students to write complete sentences. Reading Manipulatives build this concept with Subject/Predicate Match. Students must first identify the subjects (the part of the sentence about which something is told) and the predicates (the part that tells something about the subject). Initial capitalization and final punctuation would be signals, so these should be omitted. Students then match the subjects to the predicates, forming sentences that communicate a complete thought. able to select a topic for each paragraph and support it with details. Next students must learn to combine paragraphs into compositions. Style and quality are developed as they become more experienced writers. While the best way to improve one’s writing is to write, manipulatives are effective for building some skills that are necessary for writers. Students need instruction in order to learn to effectively use transitions to build coherence in their writing. Most inexperienced writers have a difficult time getting their compositions to flow. A composition as a chain of events, thoughts, or ideas, and to be effective, the links need to lock into one another without the reader noticing. It is well chosen transitions that make this happen. Transitions & Conjunctions manipulatives teach students the functions of these words and expose them to a wide variety of transition word options. Outlining is a powerful tool for writers, and it is particularly suited to factual essays or reports. Prior to learning to outline, students should be able to identify the topic sentence or main idea of each paragraph they read. The Paragraph Sequencing manipulatives improve this literal comprehension skill. Once students know that each paragraph develops the story topic and is about a main idea, or subtopic, they are ready to reverse the process and learn outlining. At this point, teach outlining in leveled stages. After students can compose an outline, they should be able to write essays from outlines. Initially, students should be provided with a straightforward essay starter that clearly defines the content of each paragraph. They should be able to use teacher-created outlines to guide compositions. With practice, students can write their own outlines for essays, stories, and reports.